The Blackfeather Court is a feudal court of talking crows that rules over the realm of Crow's Wood. They were hatched by the Crow Mother, and are led by the Duke of Crows. You will be given citizenship of the Blackfeather Court during the quest Decree of the Court, along with a Blackfeather Court Whistle. This faction also appears in the Clockwork City, having stolen a Daedric artifact from Sotha Sil. 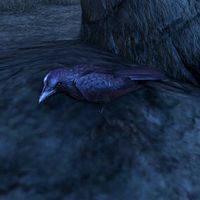 The Court offers daily quests which reward Crow-Touched Clockwork Coffers, which may contain chapters for learning to craft the Ebonshadow style. For historical information on the Blackfeather Court, see the lore article. This page was last modified on 26 September 2018, at 12:18.